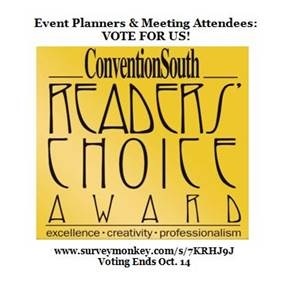 The King and Prince has been nominated for Convention South Magazine’s Readers Choice Award. Help us win the award by voting for us! If you have planned or attended a meeting at our property, we would appreciate it if you could take a moment to complete the survey as https://www.surveymonkey.com/s/7KRHJ9J. Voting ends October 14th! Thank you from The King and Prince family! This entry was posted on Sunday, October 13th, 2013 at 4:03 pm	and is filed under Meetings and Events. You can follow any responses to this entry through the RSS 2.0 feed. Responses are currently closed, but you can trackback from your own site.